In this application protocol, we describe an effective workflow to isolate and analyze exosomes from human plasma. Exosomes are pre-enriched with the Exosome Isolation Kit using MACS® technology, which enables easy and fast screening of potential exosome surface proteins with the MACSPlex Exosome Kit. Exosome lysis and elution buffer for direct loading of exosomal proteins on sodium dodecyl sulfate (SDS) gels, e.g., 50 mM Tris-Cl, pH 6.8, with 2% (w/v) SDS, 8% (v/v) glycerin, and 0.005% (w/v) bromophenol blue. The Exosome Isolation Kits can also be used to isolate exosomes from pre-cleared cell culture supernatant, pre-cleared ascites or urine, and from extracellular vesicle preparations (e.g., ultracentrifugation or density gradient centrifugations). For details, see the kit data sheet. recommended to be used prior to the MACSPlex Exosome Kit, human. For cytometry analysis, samples can also be incubated overnight with MACSPlex Capture Beads. The following instructions are for the isolation of exosomes from pre-cleared plasma. Other sample types can also be used. For details, see the data sheet for the Exosome Isolation Kits, human. Isolate exosomes or extracellular vesicles from pre-cleared plasma by positive selection using MicroBeads for tetraspanin proteins CD9, CD63, or CD81. Follow the protocol in the kit data sheet. Use the MACSPlex Exosome Kit to capture and stain the isolated exosomes. The cocktail of MACSPlex Capture Beads included in this kit are coupled to antibodies that bind to specific exosomal surface epitopes. Bound exosomes are then stained with APC-conjugated antibodies (against tetraspanins CD9, CD63, and CD81) which leads to the formation of complexes, each consisting of MACSPlex Capture Bead, exosome, and APC-conjugated antibody. Follow the protocol of the kit data sheet. Analyze these complexes with a flow cytometer based on the fluorescence characteristics of both the MACSPlex Capture Beads and the APC-conjugated antibodies. Formation of complexes that enable flow cytometry analysis of exosomes. With the MACSPlex Exosome Kit, dye-labeled capture antibody beads bind to surface proteins on exosomes and to APC-conjugated detection antibodies. The fluorescence of the capture beads and detection antibodies are used for flow cytometry analysis. With the MACSPlex Exosome Kit, dye-labeled capture antibody beads bind to surface proteins on exosomes and to APC-conjugated detection antibodies. 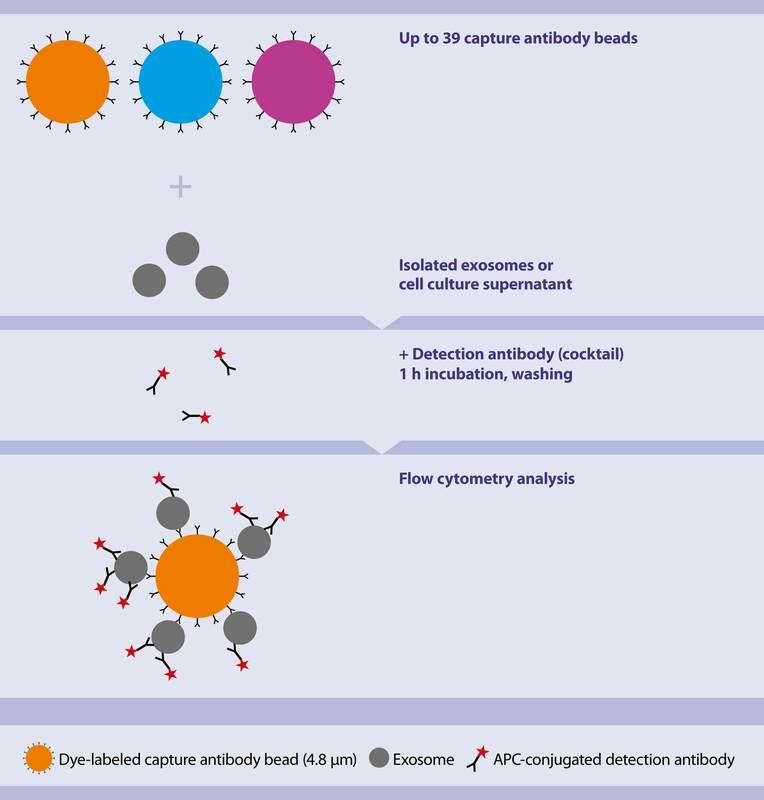 The fluorescence of the capture beads and detection antibodies are used for flow cytometry analysis. Stronger signal intensity from extracellular vesicles isolated with MicroBeads compared to ultracentrifugation. 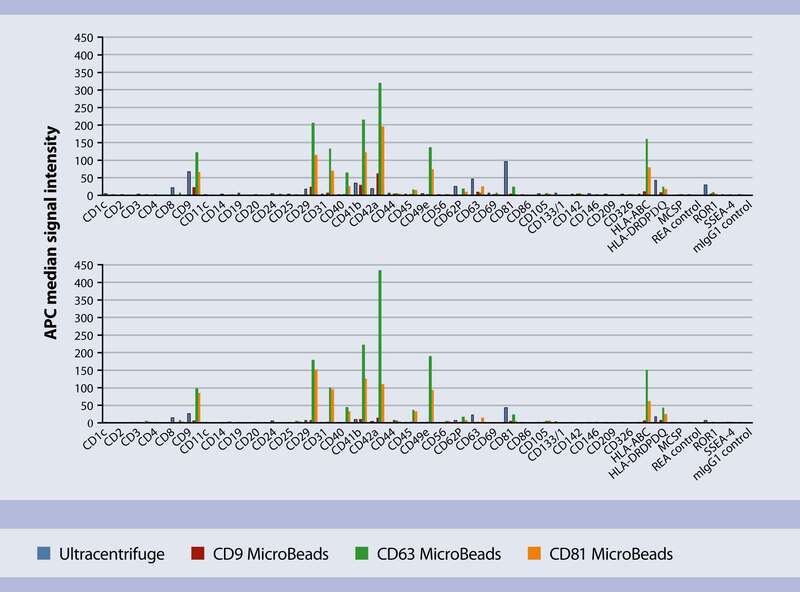 Surface marker profiles of extracellular vesicles isolated from plasma of donor A (top) or B (bottom) by ultracentrifugation or immunomagnetic isolation using CD9, CD63, or CD81 MicroBeads. Data indicate APC median signal intensities of isolated extracellular vesicles incubated with the 39 MACSPlex Exosome Capture Beads and stained with a cocktail of CD9-, CD63-, and CD81-APC antibodies. REA and mlgG1 are isotype control MicroBeads. Surface marker profiles of extracellular vesicles isolated from plasma of donor A (top) or B (bottom) by ultracentrifugation or immunomagnetic isolation using CD9, CD63, or CD81 MicroBeads. Data indicate APC median signal intensities of isolated extracellular vesicles incubated with the 39 MACSPlex Exosome Capture Beads and stained with a cocktail of CD9-, CD63-, and CD81-APC antibodies. REA and mlgG1 are isotype control MicroBeads. Koliha, N. et al. (2016) Front. Immunol. 7: 282. Koliha, N. et al. (2015) A multiplex bead platform for the characterization of cell culture–and plasma-derived exosomes. 2015 ISEV, Washington, D.C., USA. Koliha, N. (2016) Diversity of extracellular vesicles addressed by immunoaffinity beads. 2016 ISEV, Rotterdam, NL. REAfinity Antibodies Brochure: Most specific. More impact.